What Nursing Jobs are in Health Informatics? With the role of information technology increasing in health care, learning about nursing jobs in health informatics can be a good idea for someone looking into the nursing field. While all nurses work in some way with patient care, nurses in health informatics work to integrate patient care and information technology. Because of the ever increasing need for efficient healthcare delivery, particularly in helping to make and keep healthcare more affordable, the health informatics nurse role is a important one. The American Informatics Medical Association estimates that about 70,000 nurses in these roles will need to be added to the healthcare field in the next few years. A health informatics nurse integrates their skills in nursing with skills in information technology. 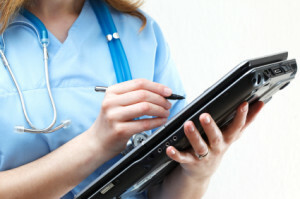 They may do that in a number of ways including managing information, evaluating technology and helping a hospital or health care system select the best technology, working to customize technology to make it more efficient, helping to actually design the technology, and helping to train other nurses and medical personnel to use the technology. Basically, nurses in health informatics can work wherever information technology meets patient care. It is important that a nurse in health informatics be a registered nurse (RN) with a strong clinical background, according to the Healthcare Information and Management Systems Society. While not every health informatics nurse will work in direct patient care, having the experience of direct patient care will make them better able to support it and to understand what nurses and doctors need in order to care for patients better. Having some experience in nursing education or management can also be a plus. A recent survey showed that many nurses in health informatics went into informatic work with a background in medical/surgical and critical care work. Clearly the scope of the field is wide, so there are many different types of jobs you might actually do as a health informatics nurse. Some of these include: nursing education and research, chief nursing officer, technology developer, software engineer, consultant to hospital or healthcare system (especially in implementing technology), chief information officer, and healthcare policy developer. With such a wide range of job possibilities, you could end up working in any number of environments from hospitals and clinics to public health centers to research labs, healthcare systems and even insurance agencies. What makes nurse in health informatics so valuable is that they help to integrate information technology into various working environments so that nurses and other personnel can manage their workflow more effectively and patients can be better served. By optimizing the management of information and technology, nurses can help to keep healthcare costs down and the quality of healthcare up. The goal of the American Nursing Informatics Association (ANIA) is to help nurses in this field learn to do just that. The ANIA’s tagline is “where caring and technology meet,” and that’s a good way to describe nursing informatics. ANIA is a good first place to turn when looking for general information about the field and the education needed to enter it. At their website, you can also finding listings for specific nursing jobs in health informatics.